Yard signs are a great way to advertise in your yard or show off your beliefs. These signs are affordable and easy to install as all you need to do is pound them into the ground. Your yard signs can show anything from your political affiliation to an advertisement for your business. Today we are going to give you 6 tips to help get the quality yard sign you are looking for. The more colors you use on your yard sign the more expensive the printing is going to be. To keep prices reasonable, it is recommended that you not exceed two colors. Once you get to four colors, the prices are quite high. Ordering a variety of formats when it comes to yard signs will cost you more money than bulk ordering one format. The printer has to have the other design uploaded and that will take a slight amount more time. Bulk orders also tend to get discounts to help you save money. Yard signs are available in a wide range of material. Picking the right material will help you to get a sign that is going to last. Your sign won’t fade in the sun and during the rain, it won’t get waterlogged. If your sign starts to get damaged it reflects negatively on your overall point. Think about where you are going to be putting your yard signs. In the grass? Against your fence? Against your home? You are going to want to pick colors and designs that stand out. Try to pick colors and designs that will stick out without being garish. Before you have anything printed you should draft up your design and look over it carefully. The last thing you want is to have spelling errors in your design. Having a friend look over the draft will allow you to have a second set of eyes. It is easy to miss something the first time around. 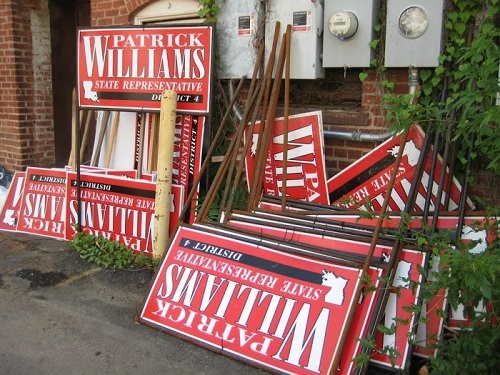 After you are done with your yard signs make sure that you keep the various pieces. Stakes and wires can be reused and offer you a good bit of savings the next time that you need yard signs. Now you have six of the most amazing yard sign tips. Each tip is designed to help you get the best order of yard signs possible. Share with us any tips you may gain from your experience in the comments section down below. How Real Estate Signs Are Better Than Any Other Advertising When Selling A House.